In “The Second Coil of Bahamut”, the effect of The Echo will be increased. The Echo will be applied upon commencement of duty, and max HP/dealt damage/effect of restorative magic will be increased by 15%. *Restarting will not increase the effect. It will now be possible to queue solo for “The Akh Afah Amphitheatre (Extreme)” in the Duty Finder. An issue wherein the battle with Phlegethon in “The Crystal Tower: Labyrinth of the Ancients” would not progress normally under certain conditions. An issue in the special quest “The Ties that Bind” wherein the message when obtaining the “Embrace” emote would display repeatedly. An issue in the special quest “The Ties that Bind” wherein under certain conditions it was possible to progress the quest even without having acquired all pieces of clothing. An issue in the Eternal Bond special quests wherein times referenced in the quest texts were displayed in Japan Standard Time (JST). An issue wherein servers would crash under certain conditions. An issue when using the Party Finder wherein certain conditions would cause abnormal terminations of the client. An issue in the quest “The Past Is a Story We Never Tell” wherein incorrect messages would display during progression of the quest. An issue wherein the quest title for “Guildmaster, Prelate, and Plot” would display in Japanese. ■Starlight Celebration NPCs and Objects now appear in residential district subdivisions. Additionally, we would like to mention that quest icons currently appear over NPCs’ heads and on the minimap, but not in the map window. With few days remaining in the seasonal event, we are working to implement a solution to this quickly. Your feedback is very important to us, and we will be more careful when designing future events. We apologize for any inconvenience that this issue may have caused. The following adjustment has been made to the Ceremony of Eternal Bonding. -If a host entered the venue as a Guest, s/he became unable to reenter as a Host, but an adjustment has now been made to allow re-entry. The following issue affecting the Ceremony of Eternal Bonding has been addressed. An issue in “Amdapor Keep (Hard)” wherein the boss would occasionally cease to use certain actions under specific circumstances. An issue in “The World of Darkness” boss battle wherein a second screen blackout would occasionally occur after moving to a different area. An issue wherein Frontline servers would occasionally crash under certain conditions. An issue with the Ceremony of Eternal Bonding wherein, under specific circumstances, the ceremony would proceed with a guest being treated as the host. An issue wherein shards/crystals/clusters would not be displayed or able to be purchased from the estate ground retainer’s sale list when put on sale. An issue in “The Second Coil of Bahamut - Turn 4” wherein the monster effect “Binding Chain” did not wear off at the intended time. An issue in “The Second Coil of Bahamut - Turn 4” wherein the monster “Dalamud Spawn” did not always draw in “Dalamud Fragments” properly. An issue in “The World of Darkness” wherein players could not leave the “Belly of the Beast” area after defeating Cerberus. An issue in Frontline’s “The Borderland Ruins (Slaughter)” wherein the cast time for the Adrenaline Rush action “Cometeor” was too short. An issue in Frontline’s “The Borderland Ruins (Secure)” wherein the message that appears when a specific monster appears was incorrect. An issue in the quest “Bait and Switch” wherein gear would spiritbond too easily. An issue in the quest “Fear and Odin in the Shroud” wherein Scarlet’s dialogue would not appear. An issue in the final main scenario quest introduced in Patch 2.5 wherein Yda and Papalymo’s dialogue would not appear. An issue wherein the rogue/ninja buffs “Kiss of the Wasp” and “Kiss of the Viper” would wear off after exiting a non-level-sync dungeon. An issue wherein placing more than one of the housing item “Expansion of Duties Permit” simultaneously could cause the client to crash. An issue wherein the action “Mount Roulette” would not work if your chocobo was stabled. *As a result of this fix, players will no longer be able to use “Mount Roulette” while mounted. An issue in the area “The Wolves’ Den Pier” wherein summoned pets could not go up to the second floor of the Braveheart. An issue wherein the Active Help “Crystal Tower Rewards” mentioned “Syrcus Tower” instead of “The World of Darkness”. An issue wherein the text that appears when examining a “Primed Wheel” would not display properly. An issue wherein the Fish Guide text for “Gigant Clam” was in Japanese. An issue wherein crafting while equipped with the dyed versions of the following items would temporarily cause the items to turn back to their pre-dyed state. *This issue will resolve itself by simply changing areas or relogging. An issue wherein certain graphics would not display properly when the following items were equipped. -Added a line to the Mount Roulette issue. The following items can now be dyed. An issue wherein the Gold Saucer category may not unlock even after the quest “World of Wonders” is completed. 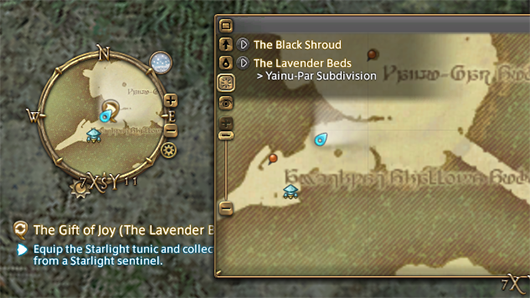 An issue wherein icons related to certain Gold Saucer achievements are not displayed properly. An issue with the Gold Saucer wherein voices, sound effects, and system sounds may cease to work during continuous repeated play of a mini-game. An issue with the Gold Saucer wherein the character may become uncontrollable during purchase of the “Mini Cactpot”. An issue with the Chocobo Race wherein incorrect bracket numbers are displayed on the inside of the starting gate as the race commences. An issue with the Chocobo Race wherein the black screen between scene changes lasts very long, or may remain black, making further play impossible. An issue with the Triple Triad card tournament wherein card tournament subcommands are displayed even in areas where tournament card battles cannot be held. An issue with Triple Triad wherein the card name for “Moggle Mog XII” is incorrect. An issue with the seasonal event “A Thorne-y Relationship” wherein the dialog window may not be displayed when talking to the NPC Nanapasi. An issue wherein the FATEs “Tower of Power” and “What’s on Your Mind” will not activate simultaneously. An issue wherein the server for the residential district would crash under certain circumstances. An issue in “The Steps of Faith” wherein progress may become impossible after failing in the defense, and players may become unable to exit the Duty. An issue wherein, in the time between completing the quests "So You Want to Be a Jockey" and "So You Think You Can Ride This Chocobo", the NPC Tataru, who should not normally be there, appears in the Arcanists' Guild in Limsa Lominsa Lower Decks. - An issue in "The Final Coil of Bahamut: Turn 2" wherein players that had joined mid-progress would not be able to trigger certain mechanics properly. - The weekly cap on Allagan tomestones of poetics has been increased from 450 to 900. *The maximum limit of 2,000 remains unchanged.